Truth be told, the French have always had a bit of a...réputation. They know their food, and, well, they know they know their food, if you know what I mean, and Le Gobelet, Leura, is no exception. 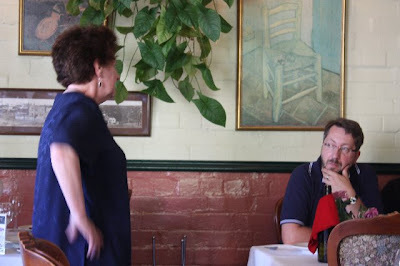 This is hallowed Blue Mountains Dining Turf, a down right institute of French Culinary Genius, the French food is the best I have ever had, in Sydney, and in Paris. The food, however, is only half of the fun. Husband and Wife team, Chef, Rene and Host, Mirelle, have been running this fine establishment for years. When I think of Mirelle and how to describe her, what begins as a small, unassuming smile, has grown rather large and unbound on my very amused face. Escargot and Amanda had never once crossed paths until this fateful day. With a WhatTheHey I tucked into some salty, squishy, buttery, garlicked heaven. These are delicious. If you have never tried Snails done in this way, or at all, they taste not entirely unlike garlic prawns, but a little richer and more exotic. Pop them whole into your eager mouth and let them gleefully detonate there. 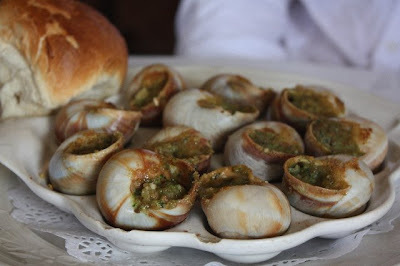 With some hot, buttered bread on the side, they are a great rejoinder to chilling mountain weather, even though they arrive as quickly as they would have done if the snails had made their own way over to your table, they are so worth the wait! 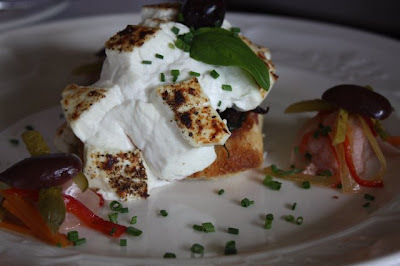 ...Just like Goat's Curd, lighter and frothier than baby's breath, like a rich creamy cloud with sharp and dreamy flavour resting on some crunchy french toast, beautifully contrasted by the saltiness of the pickles and olives. It's a very rich and satisfying entree, so fresh and gorgeous, it's nice to dwell on it while luxuriously sipping on some good wine. It might be an incredibly childish admission, but I never feel quite so suave or adult as when I am eating a cheese dish in a restaurant, something very undeniably sophisticated about the whole damn thing. 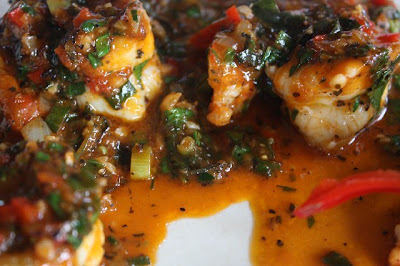 My favourite entree, however, has to be these divine garlic prawns. My family and I have been ordering these for years. Renee finishes fresh, luscious, fat prawns beautifully with a tomato based herb, shallot garlic paste. They are much lighter and livelier than your usual garlic prawns, which, like dating Antonio Banderas, can usually be an incredibly oily affair. The garlic is gentle and not too heavy (good for you non Arab garlic amateurs). This is a dancing dish, it balances all of its flavours seamlessly, I order it every single time. Rare, slightly bloodied, damn fine steak is a beautiful thing to behold, sorry Vego's, it is. Always has been, always will be. 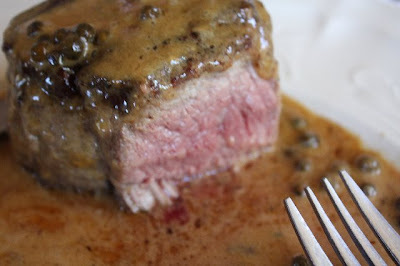 Cooked to a bare tender perfection and smothered in some brandied sweet and creamy peppercorned sauce, trust me when I say you'll be moo-ved. If Eye Fillet doesn't do it for you, splash out on the Chateaubriand, and let the cow tip you. If it's been a while since you have relished a truly epic steak, then the experience will justify the price. Order a beautiful little vege side to go with the steak, some rat-a-tat-tat-atoullie, wonderfully spiced and jazzed up with heady sharpsweet tomato, paired with some devilish good roast potatoes, it's a classic, tweaked to Frenchection. Poisson? 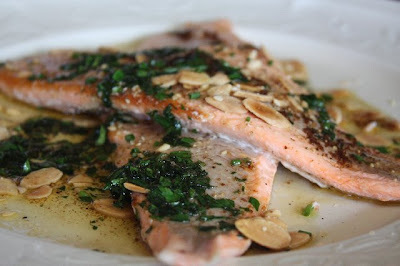 A delicate, thinly sliced Salmon, not at all over cooked, moist and tender, dressed with some buttered parsley and slivered almonds proves a very moorish fish main. Salty and Rich but still a with a delicateness of flavour, it has a very provincial taste, and Renee always uses the freshest Fish. Mum orders the fish when she isn't too tempted by the sublime Coq Au Vin, which is good enough to leave you speaking in (French) tongues. The standard here is set, and they just meet it time and time again. I have never had any of these dishes even slightly off, Renee's is not a rushed kitchen, he takes the time required to bring every dish to its absolute finesse, it is incredible food. 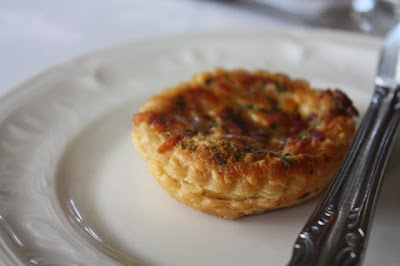 Unlike other French fare I have tried, they don't rely on too much oil, cream, cheese or butter, the food is rich, but is never excessively so. Or at least that's what I tell myself in order to justify dessert, not that dessert every really needed justification. 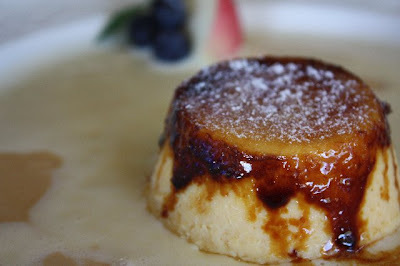 Creme Brulee is a wicked little invention that I am finding myself more and more enamoured with as the years kick on, and this burnttoffeedvanilla tooth dream does not disappoint in the least. The gentle lusciousness of the cream collides maddeningly with the burnt sugared crunch, it's a decadent-in-saccharine punctuation mark to a perfect succession of salacious savouries. But nothing says francais like a Crepe. 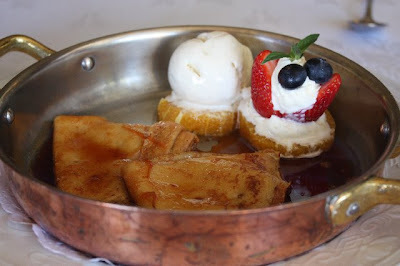 Crepes - the thinner, cooler older sister of the pudgier pancake - are divine. I have gobbled more than a few with nutella and banana in Parisian Backstreets. I like my crepes served with a heinous amount of hazelnuttishchocolateness. Bulging, velvety chocolate gooishness, heavingly ensconed in some thin crepe membrane does it for me in ways I won't pain you, or myself, to imagine. But the old schoolers still swoon over the lemon and sugar, and this, the orange and grand mariner. I am not a fan of liquor in anything, so, like Mel Gibson mid anti-semitic tirade, this treat was a little boozy for me, but still lovely with its shy glaze of syrup in citrus. It comes to the table, a gift horse for your suspicious mouth, like a little Troy that fell for a mesmerising Helen, all fabulously and furiously, a flambe. True desire always always involves consuming flames. Mirelle confided to us that they are considering retiring soon. Ouch. I doubt that any new owners could match a standard so consistently and uncompromisingly maintained for so many years. Let the distance be no excuse, if Blaxland, Lawson and Wentworth got this far on horseback, you should be right to cruise for a little over an hour in your snazzy automobile down the M4. A Great Dividing Range of dishes awaits you, but perhaps not for long. Le Gobelet at 131 Leura Mall, Leura. Phone: 4784 1919. ps...I would like some commendation for not once resorting to use of the very hackneyed 'bon appetit' during this entire Francophilic piece, you have no idea of the resolve that courses through this blood. 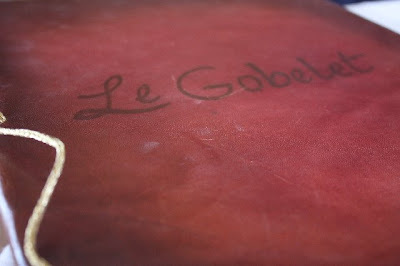 I love Le Gobelet too.